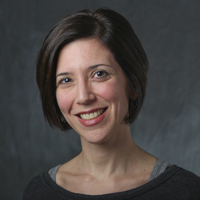 Dr. Rachel Mesch, Associate Professor of French and Chair of Foreign Languages and Cultures at Yeshiva University, graduated from Yale University. She received an MA from Columbia University and a PhD from the University of Pennsylvania. She specializes in 19th-century French literature, and her main areas of research and teaching include naturalism and decadence, women writers, gender studies, the French Enlightenment and the Belle Époque. I taught at Barnard for several years right after graduate school, then spent a year as a visiting assistant professor at Columbia before coming to YU in 2007. It’s funny that I spent six years teaching only women and now teach only men, although I hope to have opportunities to teach at Stern College for Women at some point. Because of the size of the undergraduate schools, we aren’t physically divided up into departments, which means that I interact regularly with colleagues in pretty much every academic discipline – Sociology, English, Jewish Studies, Physics, History – and we are always learning from each other. I count so many of the people I have met here in the last six years among my closest, dearest friends. That’s pretty incredible. Well, the great thing about being a professor is you get to combine lots of different professions: I am part writer, part actress and part psychologist, all careers I considered at one point or another. And with the administrative part of my job as Chair of Languages and Director of the new YC Core curriculum, I also get to do marketing, web design and public relations. So I’m good, no need to look for other career paths! 4. What is your goal as a scholar of French literature, and what is your goal as a teacher? In my scholarship, I am always looking for subjects that I can really connect to. I need to know why I am writing about something. My new book (Having it All in the Belle Epoque: How French Women’s Magazines Invented the Modern Woman) was particularly exciting that way, since the question of work-life balance continues to be so compelling for so many women – it was fascinating to discover how French women were working through these issues 100 years ago. With my students, it’s the same thing: I am looking to engage them and find that excitement. It’s rarely only about covering a set of material, but about connecting to texts on a deeper level. I love seeing the light bulbs go off in the classroom when a student really discovers something interpretively for the first time. For me, it’s about introducing students to the pure pleasures of intellectual discovery. That I’m pretty addicted to prime time television. I like to mix my pop culture with my high culture. I also think they’d be surprised to learn that my grandfather, a RIETS graduate who was ordained by Rav Kook, was a rabbi in Birmingham, Alabama, and that I grew up in Gainesville, Florida. People are often surprised by my southern roots.